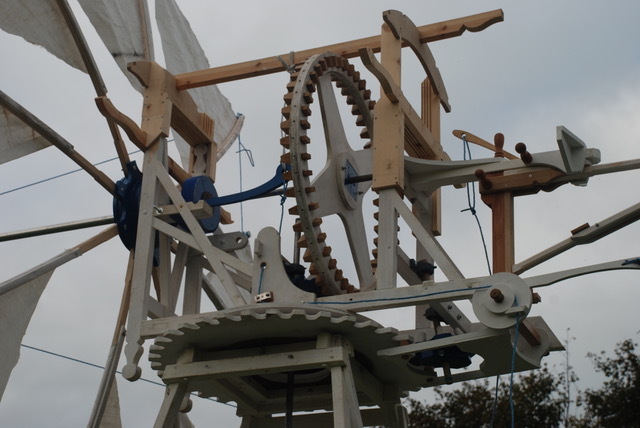 WhiteMill is a mobile wooden Mediterranean style windmill with an integral water pump and water purification unit. It is trailer mounted, self-contained, and when positioned near a raw water source, with the application of a little wind, will supply pure water. At 6.5 metres overall height, with a sail wingspan 5 metres, and an open framework containing the large scale handmade wooden gearing, steel shafts, pump, tanks and controls, WhiteMill is a marriage of wooden millwright’s craft and the latest in filtration technology in answer to the oldest challenge, clean water supply. It is an expression of the human fascination with mechanisms; transparent, exuberant, aesthetic but nevertheless focused on the provision of one essential element; pure water, by the harnessing of another; the wind. Filtration spec. 2 stage particle filters, 1 granulated active carbon filter and 12v UV stage for final sterilization. Mark Zygadlo is an artist, maker and writer based in Dumfries and Galloway. Recent projects include Tide Machine. 2010-12, originator and collaborator with Oceanallover. Lost Supper. 2012-14, originator, collaborators: Mischeif LàBas and Oceanallover. Nithraid. 2013 – present, ongoing annual event with the Stove, Dumfries. Secret Ministry of Dreams, (Secret Ministry in collaboration with BRAT Teatro, Friuli and Venice) 2016-17, ongoing. Rosefield Mills Project with Dumfries Historic Buildings Trust.